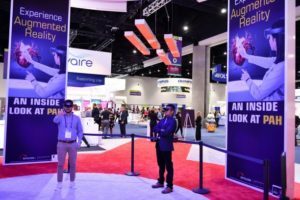 Extend your learning process with ATS 2019’s interactive, hands-on demonstrations, virtual reality experiences, and a variety of Industry Theaters, Practical Workshops, and Guru Bar presentations in the Exhibit Hall. Hands-on demonstrations at exhibitor booths give you the opportunity to learn on the spot. Experience innovative products up close and speak with experts to explore innovation and technological advancements. Studies show that 79 percent of COPD patients misuse their inhalers. Enter In Check™ DIAL, a new generation for inhaler training and assessment. Try it out to see how you can help patients achieve optimal delivery from MDIs and DPIs. See firsthand how Breath Biopsy works with an in-booth live demonstration. Breath Biopsy offers a non-invasive approach for discovering biomarkers in a research setting for respiratory diseases such as asthma and COPD by analyzing the volatile organic compounds in breath. Vathin Medical Co. Ltd. will use a medical mannequin to help explain the function of its disposable bronchoscopy. Through this interactive demonstration, you’ll even be able to try it out for yourself. You’ll be a believer from the moment you strap the goggles over your eyes. See for yourself how science is advancing with take-home virtual reality goggles that bring to life eosinophilic asthma and the mechanism of disease. Do your patients need something in between inhalers and jet nebulizers? Learn more by immersing yourself in an educational virtual reality experience. New methodology is just as critical as new products, and you’ll find it at ATS 2019. Scientists at Cincinnati Children’s Hospital have created a decision tool called Pediatric Asthma Risk Score (PARS) to predict asthma in children. Testing has shown PARS to be more accurate than the Asthma Predictive Index (API), the gold standard, in predicting asthma in children with mild to moderate asthma risk, the group of asthma patients most likely to respond favorably to prevention strategies. Take part in 90-minute learning opportunities to gain hands-on education and skill-building. The workshops are hosted by medical device companies and manufacturers from 12:30-2 p.m., Sunday through Tuesday. Gain a deeper understanding of disease areas and explore the latest products from pulmonary, critical care, and sleep medicine while having a light lunch during Industry Theaters. Complimentary boxed lunches are provided by the ATS while supplies last.